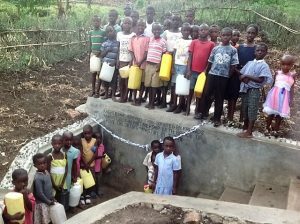 Bridge of Hope Children’s Ministry is saving many lives of people living in Rukungiri, Uganda by providing them with a clean water source. Given the choice we would all choose to drink clean water but in Uganda thousands of people have no alternative but to drink dirty and potentially life threatening water. UNICEF states that one in five children do not have access to clean water and this fact alone strengthens our vison to provide this life saving facility to as many families as possible. As women and children are the main water carriers their lives are further affected as they may spend several hours each day collecting water from the nearest water source which is normally a dirty pond which is also frequented by animals. Children’s school attendance is poor when they have to fetch water or when they become ill from the water they drink. 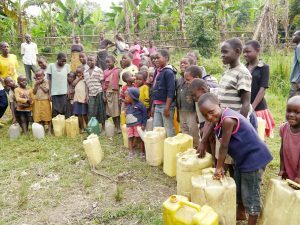 Bridge of Hope Children’s Ministry works closely with a Ugandan water engineer and the community that will receive the clean water. Eve ry potential water source is assessed to ensure suitability and a continuous yield of water before construction of a Protected Spring Tank can be agreed. The local people must agree to commit to carrying the materials from the nearest road to the site and to offer their labour for the excavations required. This contribution ensures that the community truly own this precious resource. Having clean water changes so much for a community which normally consist of approximately 200 hundred people and a school. Once the protected Spring Tank is built the community can draw clean water every day. As a result the overall health of the people is greatly improved and therefore children can attend school regularly and adults can use their time more effectively to grow food and care for their families. We are always delighted to officially hand over a completed Protected Spring Tank to a community as we know that clean water saves lives.